So here is the final Christmas edition of Soundtrack Of A Photograph. This song needs no elaboration on my part of course. I wanted to wish all of you a very Merry Christmas and a Happy New Year. Whether you have been reading my blogs throughout the year, or have just come across them recently, I sincerely thank you for your support. I will be taking a short break from writing for a few weeks, but rest assured there will be more blogs to come in 2015. Well after today there is only one more Christmas Edition of Soundtrack Of A Photograph left. As Christmas is now hours, rather than days away, I thought it was time for a song that was more substantial today. Maybe it is just me, but I seem to be able to switch my Christmas music listening around at any given moment. In other words, I can listen to The Ventures doing guitar instrumentals of ‘Frosty The Snowman’ and follow with a choral group, and then follow that up with something classic from someone like Bing Crosby or Nat King Cole. So after writing these blogs about artists from folk, rock, soul, gospel and country up to this point, I thought we really needed a song from a choir today. 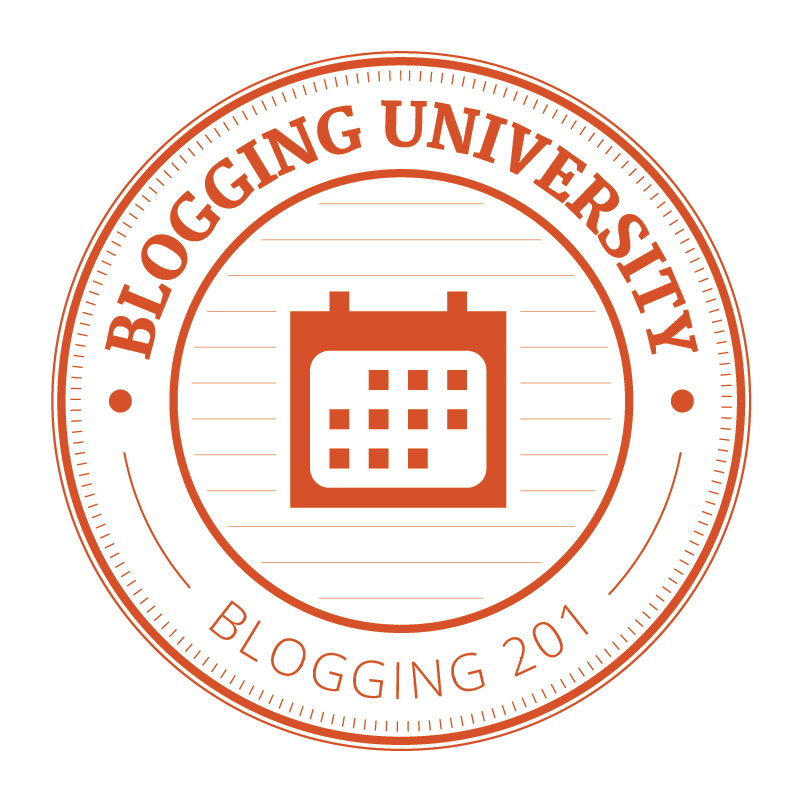 But as you may have noticed at this point, I seldom take the easy way when it comes to writing these blogs. Though in this Christmas series I have written about a few classics like White Christmas, I prefer either lesser known songs and artists, or at least very different versions of the songs. The producer Joe Boyd once famously said, “Don’t give them what they want, give them what ought to have.” So even with writing about a choir song today, I have decided to stick to that motto. You can hear the origins of it being a lullaby clearly. One does not have to be a musician to appreciate the simple beauty of that melody. It is only a few notes but they manage to convey so much feeling from their sparseness. Though I have heard English language versions of the song, I prefer the Welsh so much more, in part because it is such an interesting language. From the moment I heard it years ago, that melody has stayed with me. As I mentioned the other day, it is one example of a Christmas song I find myself humming, or humming in my head throughout the year. 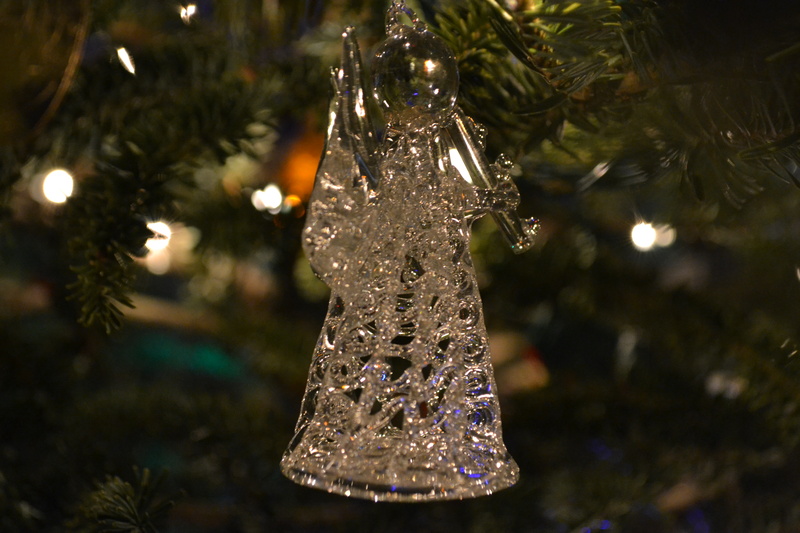 The photo I am using today is of a simple glass angel ornament from our tree. In thinking about this song today, I just thought of the simple melody of Suo Gan, and once again returned to the idea of a simple ornament saying so much and stirring up so many thoughts for us when we take them out of the box once a year at Christmas to hang on the tree. It seemed a fitting choice for a great lullaby song. Or a great lullaby Christmas song. Or just a great song. Please join me tomorrow for the final edition of the Christmas Soundtrack Of A Photograph and I do not say this as often as I should, but please share these with your family and friends. 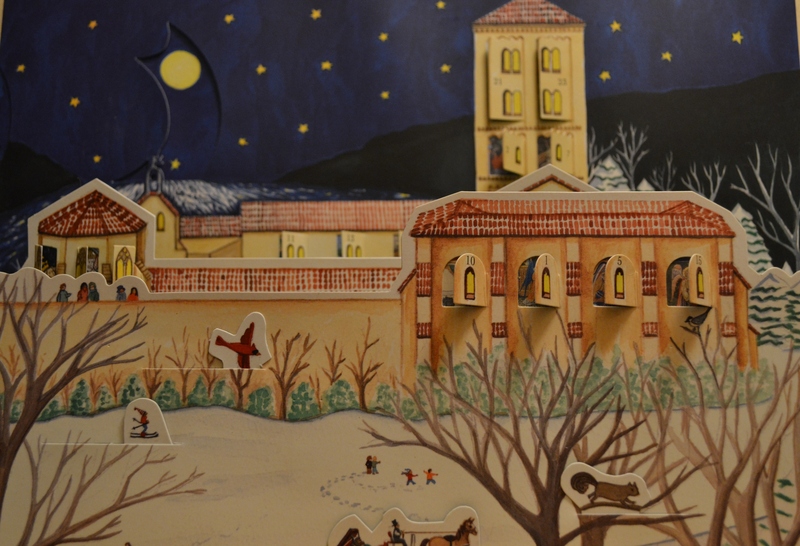 The Advent Calendar which we bought a few years ago from the Cloisters Museum here in New York City which sits above the CD’s in our apartment, and next to other holiday decorations informed me this morning that it was December 22nd. Which reminded me that I only have three more installments left of this Christmas blog series. I hope you have been enjoying them. Though it has been tough setting time aside each day to do them in between work and family and shopping, I have really enjoyed writing them. That calendar was helpful this morning in fact because I realized back on December 4th, with the fourth installment I wrote about my favorite Christmas album- Bruce Cockburn’s Christmas. I had mentioned that I enjoyed this album so much through the years, that I would be returning to it. Well time almost slipped away for me to do that, but opening up the door to ’22’ this morning reminded me I needed to do it today, or not at all. It’s now or never, as Elvis sung once. As I said in Part 4, Bruce’s album is so great because of the variety of sounds on it. There is the spooky ballad Down In Yon Forest. There is a song in Spanish, Riu Riu Chiu, and one sung in French-Les Anges Dans Nos Campagnes (the origins of Angels We Have Heard On High). There is even one sung in the Huron language, Jesus Ahatonnia. Bruce also wrote a nice little song called Shepherds for the album. There are dulcimers and hammered dulcimers, electric violin and electric guitar. There is folk, and there is rock. Maybe the most pleasing to me though on the album are the Gospel driven songs, of which there are three. The second song on the album is the stomping Early On One Christmas Morn, and later on the classic Go Tell It On The Mountain. My absolute favorite song on the album however has always been Mary Had A Baby. If you have not been clicking on these links to the songs, I really urge you to give this one a go. Indeed, Saint Helena is a center of the Gullah tradition and although the origins of call and response come originally from Africa, the American form of it is heard especially in Gospel music today and has its roots with the Gullah. Perhaps because of the call and response I was immediately hooked by the song. The metallic and percussive clank keeping time, along with the hand claps and an almost funky back beat sealed the deal. Can I also just say that if ever there was a Christmas song to play loud, this is the one to do it with surely. I have subsequently come across this in other versions now, and though I think it is a great song period, nothing will ever sway me from liking Bruce’s version the most. So this morning I am especially glad I opened that door on the Advent calendar so I could write about my favorite song, on my favorite Christmas album. I hope it becomes one of your own favorites too. Yesterday my family got together for an early Christmas celebration. Even though we all live close to each other we all do our own thing on Christmas Day now. But usually close to Christmas we gather at mom and dad’s apartment to decorate the tree and exchange gifts. As the day progressed, I realized the day was a microcosm of sorts of all the things I have written about in this Christmas series thus far. It started off with me putting the lights on the tree, and before long we all started putting the multitude of ornaments on. 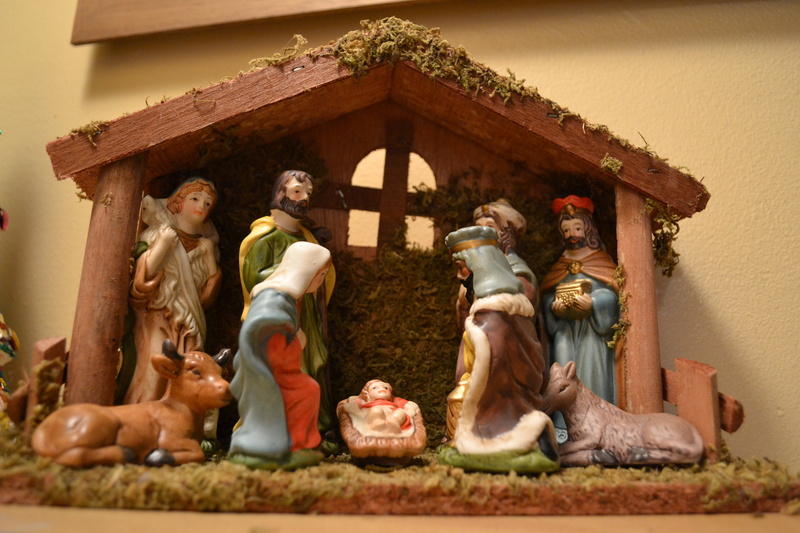 At some point, in a box with some other decorations was the nativity scene. With my niece’s help it was soon set up on a side table. Beer and other beverages were in abundance along with lots of food. As the pile of ornaments that are a mix of old and new gradually got smaller, it was time for the three elf ornaments to go on by my sisters and myself, a Doyle family tradition for years now. Earlier this week, a fellow blogger posted a question on her blog about what traditions people followed (http://loveandolives.com/) at this time of year. Those rituals that families do at this time of year especially. For some it might be all going together to buy the tree. For others it might be the same meal that is served at Christmas every year. Or maybe who gets to put the star or angel on top of the tree. Perhaps for some it is the songs that are sung, or something as simple as sitting down to watch classic Christmas movies like It’s A Wonderful Life, or Miracle On 34th Street. 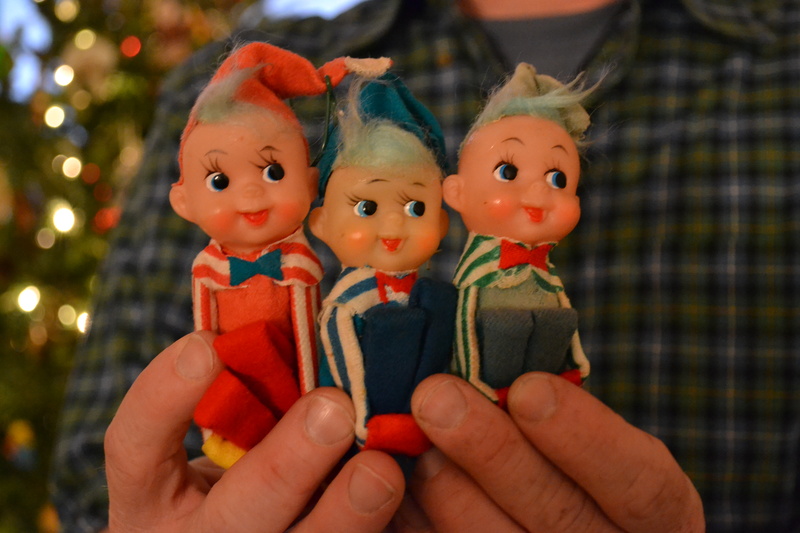 My family has variations on those of course, but I think the first one that really comes to mind is those elf ornaments. Though I truthfully do not remember buying them, apparently they were purchased sometime in the 1970’s at our local garden center (where I eventually found myself working for 14 years later on in life). I guess my sisters had the idea of buying three identical elf ornaments (save for the color). Though I do not remember purchasing them, I do remember as the years went on that we always had to put them on together. Nobody else could put them on the tree, and they could not be put on as if it were any other ornament. When we were not able to all get together to decorate the family tree, the elves were put aside until we were all present. In the handful of times that we were not all together for Christmas, Mom or Dad acted as proxy. 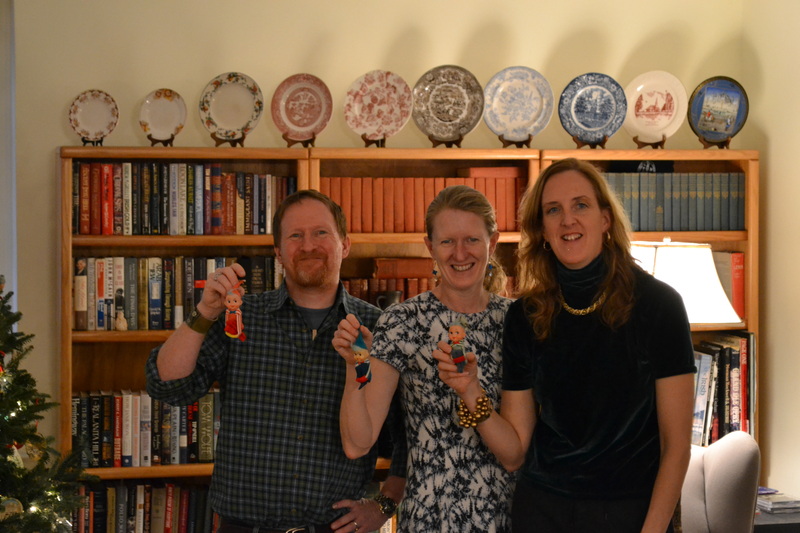 As the years went on further, we began taking photographic proof of these moments, of each of us holding our ornaments up like we had just caught a fish, red for me, blue for my sister Noreen, green for my sister Eileen. A simple tradition of course, but one that would not feel right if we were not able to do it every year. I thought hard about what song to include today. At first I thought about ‘I’ll Be Home For Christmas’ which has nostalgia built right into it. But then I realized that like with those family traditions, there are certain songs, and specific versions of those songs that I would miss, were I not to hear them every year at this time. It is just like putting those elf ornaments on the tree. It is tradition, and a Christmas without hearing Bing Crosby singing White Christmas is not something I want to ever contemplate. 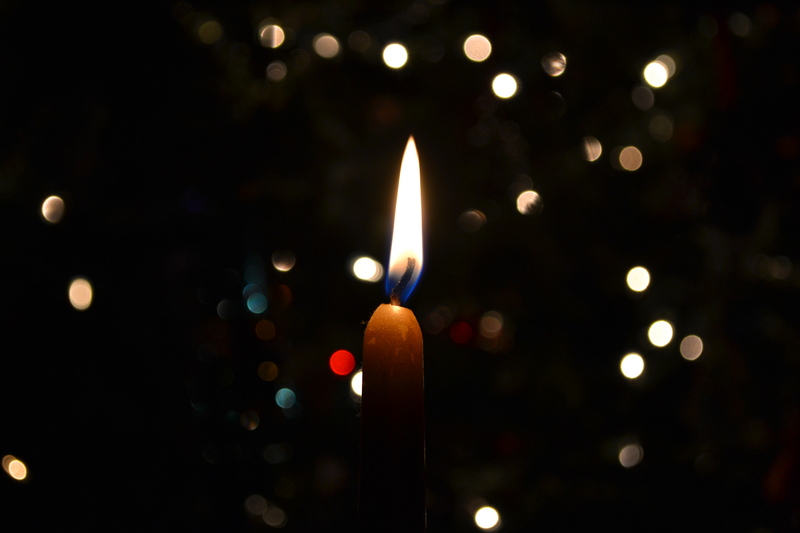 It is a fitting song to keep those traditions alive, whatever they may be for your family, and a great choice for today’s blog. Special thanks to my wife, Jennifer Andrus Doyle for taking the photos for this installment. All images in this blog are available in limited supply for purchase as unframed prints. Sizes may vary. Contact via robpatdoy@hotmail.com for details. As far as I am concerned the sound of a bell ringing is one of the most natural and pleasing sounds to the ear. Throughout the year they can be heard, pealing from churches of all denominations, resonating over towns and cities for miles around. There is something universally appealing about the sounds of bells ringing. I am not sure why that is. It might be because of the percussive quality (which I find people always respond to). It might also be because of the tonal quality they have. But it is at this time of year that bells seem to become even more present in our lives. Aside from those church bells, the Christmas season would not be complete without hearing bell ringers from the Salvation Army, ringing throughout the day and evening seeking charitable contributions. Bells are also of course part of so many Christmas songs. Jingle Bells, Silver Bells, Carol Of The Bells, The Bells Of St. Mary’s, Ding Dong Merrily On High, Sleigh Ride, I Heard The Bells On Christmas Day, are just a few well known ones that have bells as part of the title or feature heavily in the song. Sweet Bells however, may not be as well known to most Americans however. It is a variant of the song While Shepherds Watched Their Flocks which is attributed to the poet and lyricist Nahum Tate. I have been familiar with the song for many years now, and it was probably from choir versions. I also have it on CD’s from The Albion Christmas Band (see the Christmas Soundtracks Parts 1 and 17) as well as by Waterson:Carthy (see the Christmas Soundtrack Part 13). Whether by choir or folk group though, it has an interesting sort of rise and fall to the melody which has always stuck with me. That includes at times other than the Christmas season when I secretly hum the tune in my head. Or should I say melodies, because I can hum it (since I do not sing) to a few different tunes. As I have discussed in both this Christmas blog series and in the regular blogs, the reason traditional music is so fascinating to me is the alteration of songs and tunes from one place to another. So you have it that in Oxford, England a song might be sung set to one particular tune, but in Sheffield it is sung to a completely different one. It can be confusing, and can lead to a lot of, “I know this song, but not sung like this” moments the further you delve into traditional music, but it is big part of the appeal for me. We also see this in choral arrangements at this time of year too. The song I wrote about on Wednesday in part 17, In The Bleak Midwinter is a good example of this, with two distinctly different ways of singing the song possible in a choir setting. So it is not surprising at all that While Shepherds Watched Their Flocks has several variants in traditional music circles. On her 2008 Christmas album Sweet Bells, English singer Kate Rusby actually sang two of those variants of While Shepherds Watched Their Flocks. There is Hail Chime On and the song I am including here, Sweet Bells. They are both practically identical to While Shepherds Watched Their Flocks except for a different chorus. Proof of those ever so slight variations that take can take place in traditional music. If you watch the full clip here you can hear Kate talk about some of that before launching into a beautiful live rendition of the song. Just like with While Shepherds Watched Their Flocks itself, I have been a Kate Rusby fan for years. With a voice as beautiful as hers it is hard not to be. Since her entry on to the scene more than twenty years ago at this point she has built a dedicated legion of followers. It is one of those stop what you are doing type voices the first time you hear her sing. When I used to work at Tower Records and would put an album of hers on, I encountered this many times. Though I listen to her music year round, it just would not feel like Christmas without hearing her sing this song. Rather like that inescapable sound of a bell ringing somewhere this time of year, from a street corner or from a church. Sweet Bells is yet another reminder of them and I am okay with that. And with Kate Rusby too! By now those of you who have been following the previous 18 Christmas Soundtrack Of A Photograph blogs will have noticed that the photos have been a mix of ones from around the city and also…quite a few from inside our own apartment. I hope no one will accuse me of being uninspired in choosing photographic subjects from my own home. Though part of the reason for this has been lack of time during this busy time of year to get some new Christmas themed photos, it is also because the simple and personal things we adorn our homes with at this time of year can be just as meaningful. So it is with the nativity scene or creche most people put up at this time of year. For some reason growing up, I was charged with setting up the one in our home every year. My parents still have the same one, and occasionally to this day, I still find myself setting it up. It is not a particularly fancy set, but rather the usual type of thing with a wood base and fencing, with a mural as a backdrop and a roof that is slightly difficult to set in place correctly and be balanced to prevent it from toppling over. I don’t know when my parents actually bought it, but it is quite old at this point. Before the original box disintegrated, I remember faithfully recreating the image on the box. Everything had to be exactly as it was on that photo, right down to the number of sheep (attempts to merge the animals from another nativity set that were the wrong scale and made from a different material met with my stern disapproval) and the figures had to be in the correct positions as well. Fragments of straw that came with the set to be scattered over the wood base were placed year after year before it too eventually vanished. If any of the figures had been jostled and hastily put back in place incorrectly by someone in the family, I hastily corrected their error. The photo above comes not from that nativity, but a small one my wife bought a few years ago, and the reason I used this photo (other than not having one of my parents set) is simply because I enjoy seeing a nativity in the home at this time of year. Without delving into the spiritual too much here, it really is the truest Christmas decoration quite simply. All of which has very little to do with today’s song. But it is Friday, and I thought a fun, rollicking, boisterous, exuberant, toe-tapping song would be a good choice for today. It was not hard therefore to select the opening song from The Blind Boys Of Alabama’s 2004 Christmas album, the sublime Last Month Of The Year. I defy anyone to sit still during this song. I love the way the song stretches out the month of November and 25th day of DE-CEM-BER before the band and that groovy organ kicks in . I have heard a few pedantic people nitpicking this song over the years, saying how historically inaccurate the song actually is. To them I say, you may very well be correct, but for goodness sake, just listen and move your feet to this song. I also really recommend this album, Go Tell It On The Mountain as a great Christmas album to add to your collection. Lots of guest artists, but at the heart is the trademark Blind Boys Of Alabama gospel sound. So for me, whenever I set up that nativity at my parents house, or catch a glimpse of that little one sitting on top of my CD collection along with the other Christmas paraphernalia if you see me tapping my toe and bopping along, THIS is the song in my head!